Microsoft may be turning to cloud storage as a cheap replacement to files stored locally on your PC, if a leaked screenshot from a future Windows 10 build is any indication. 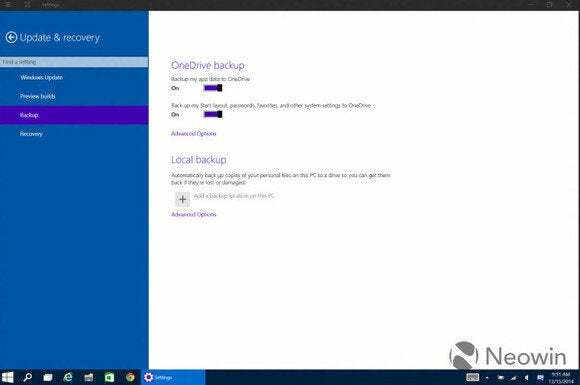 According to a leaked image of Build 9901 of Windows 10, One Drive will store app data as well as back up images, movies, and documents. Neowin, which snapped the screenshot, speculates that OneDrive is being more tightly integrated within Microsoft’s operating system. ZDNet's Mary Jo Foley has also dug up a project from Microsoft's Operating System Group dubbed "Arcadia", which will stream "not just games, but also certain apps". If that's correct—and so far nothing’s confirmed, as Microsoft isn’t releasing any “official” builds of Windows 10 before January—it would indicate that Microsoft might see a world in which OneDrive begins to replace (at least partially) local storage on cheap PCs. What Microsoft is doing now (or at least, with Windows 10) seems to be a more explicit version of what Microsoft already does with Windows 8. If you download an app from the Store, like Netflix, Microsoft will put a shortcut to that app on subsequent installs that are keyed to your Microsoft account. As Neowin notes, this just looks to be a step beyond that. Placing app data on OneDrive, however, could be a precursor to hosting and streaming selected apps on OneDrive. While such a thing might be a ways down the road, it’s still an interesting concept. Consider the argument: Local storage—whether it be a hard drive or just a small amount of flash memory—costs a notebook maker something. As competitive pressures drive down prices, we’re already seeing ”cheapbooks” like the $200 HP Stream 11 cut local storage to just 32GB. Although that seems like a lot on a smartphone, the Windows OS and any subsequent patches can cut that storage down even further. Add in a software suite like Office, and the available storage slims it down even further. Why this matters: Streaming some of those apps as a service—or hosting components in the cloud, rather than on a local PC—might make more and more sense going forward. Adobe already streams Photoshop to Chromebooks. Could Microsoft do the same for Office? Office and other apps already assume you’re connected to the Internet, anyway. At this point, it's all speculation. The OneDrive and Arcadia leaks don’t really detail what Microsoft’s plans are, and Microsoft's said nothing. Still, we could hear more about this at Microsoft’s Windows 10 consumer presentation in January. Let’s hope so. Updated at 9:39 AM on Dec. 16 with additional details of Microsoft's Arcadia plan.